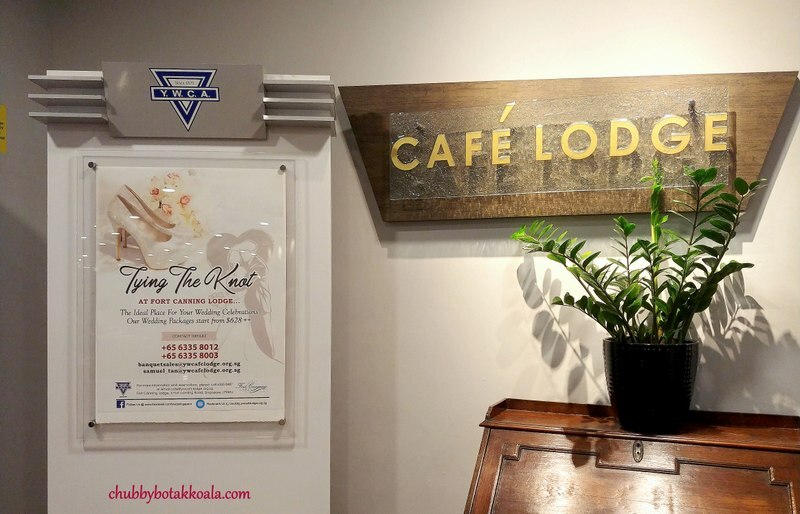 Café Lodge is the main restaurant for YWCA Fort Canning Lodge. A property managed by YWCA Singapore located in the city centre of Singapore, the prime Orchard Road shopping belt. 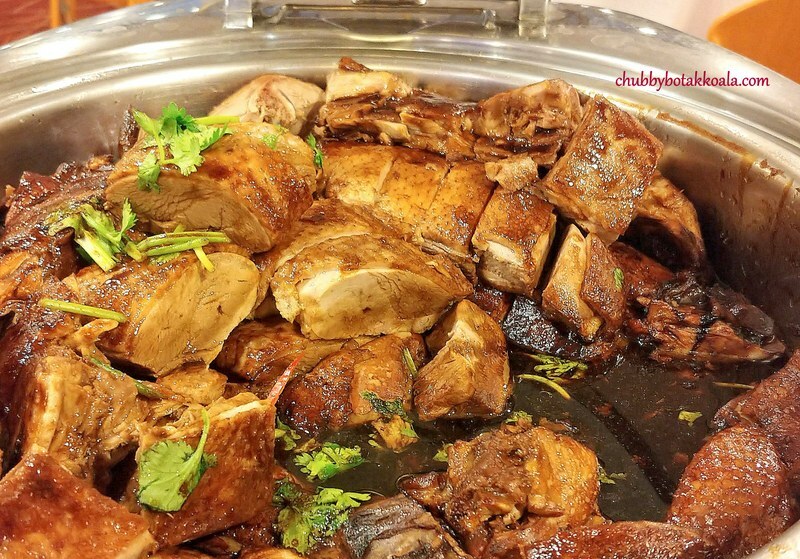 For its daily lunch and dinner buffet, it offers comforting Singaporean and Asian Cuisine. 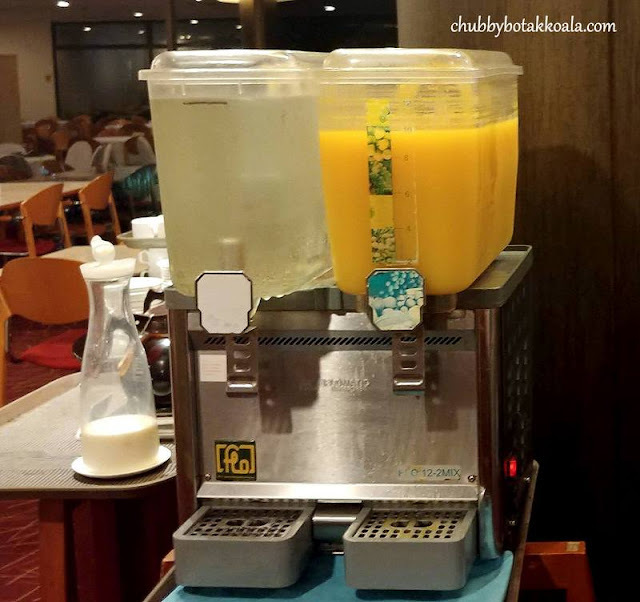 With 5 menus rotating daily, diners will get enough variety return to Café Lodge regularly. During our visit, the following dishes catch my attention: Braised Duck, Yum Rice and Braised Egg and Tofu. The duck is meaty and well braised, as you can taste the dark soy sauce and seasoning infused into the meat. The same can be said with the eggs and tofu. The yam rice is aromatic and tasty, definitely goes well with the duck, tofu and egg. Mee Rebus is the highlight of the action station. 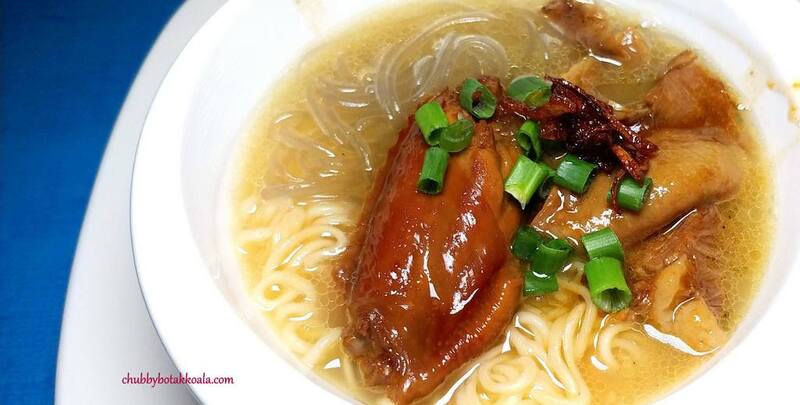 The ingredients are the same as those sold outside, including the thick brown mee rebus gravy. Texture wise, this will depend on the diners cooking skill. 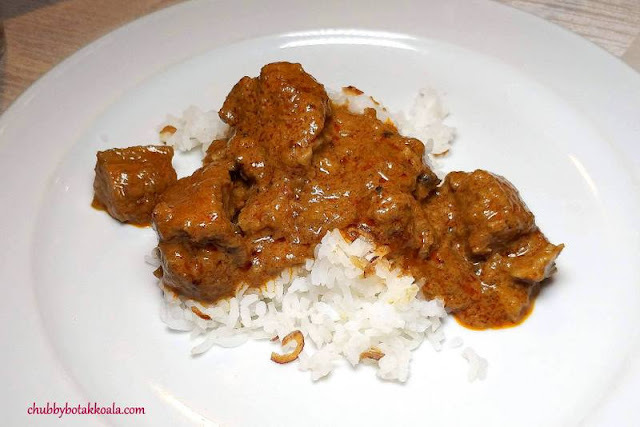 One of the other dishes that impress me is their beef rendang. The gravy is thick, rich, creamy and filled with spices. 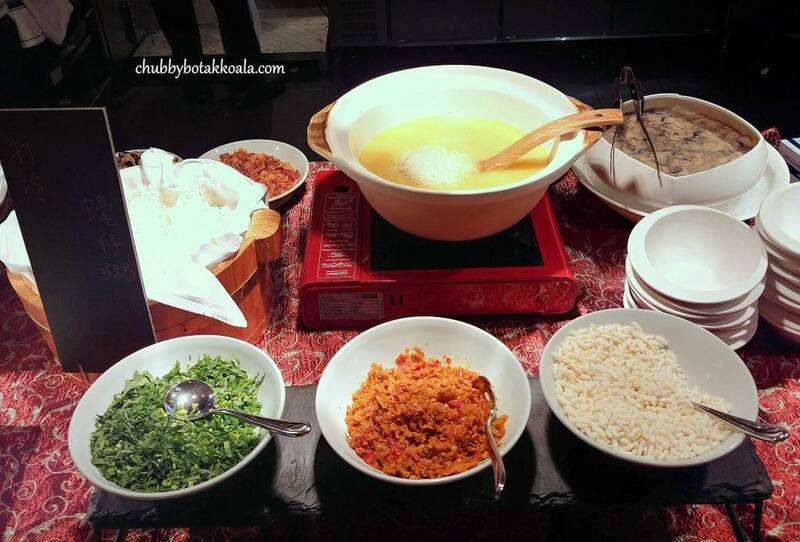 You can taste the “rempah” infused into the meat, making it “rice thief” dish. The steamed fish fillets also look delicious; however, I did not manage to try it as I was pacing myself for the Mother’s Day Menu. Part of the daily buffet also includes Soup of the Day, salads with condiments, cold dishes, cake and kueh for desserts, fruits, coffee & tea, and water and orange drinks. 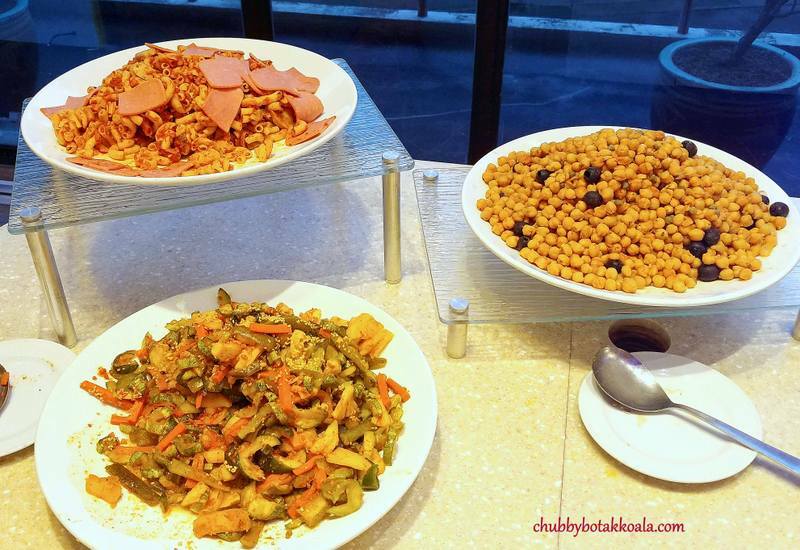 Definitely a good offering for daily buffet lunch or dinner. 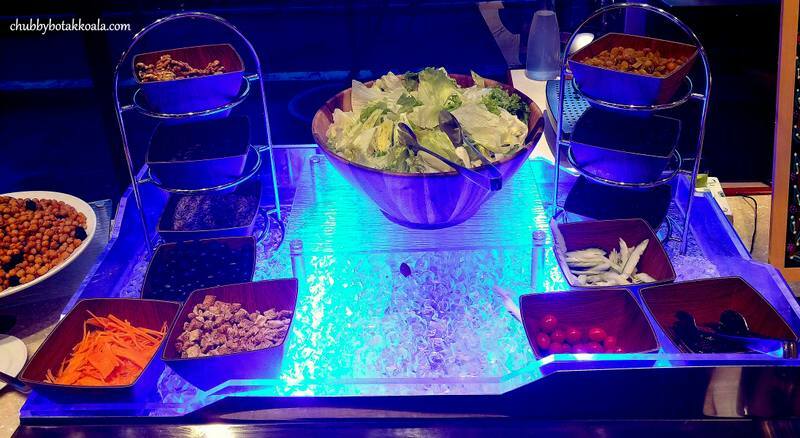 Highlights of Mother’s Day Buffet Menu includes: Avocado Crab Meat Salad and Apple and Celery with Walnuts Salad. A light and delicious way to start the meal. I personally like find the avocado and crab meat salad is very refreshing, the sweetness of the crab meat and the avocado works well together. 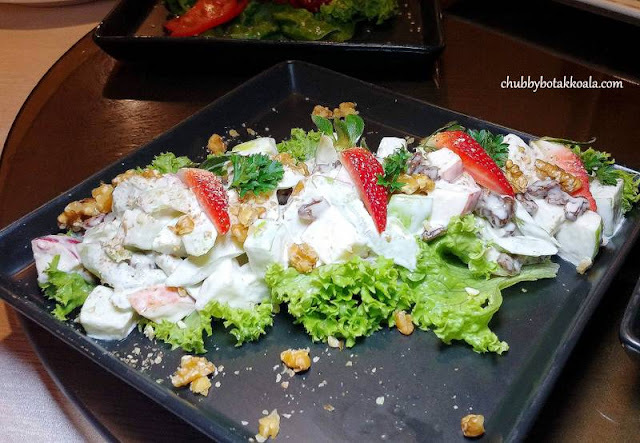 Apple and Celery with Walnuts Salad. Sichuan soup with Radish. 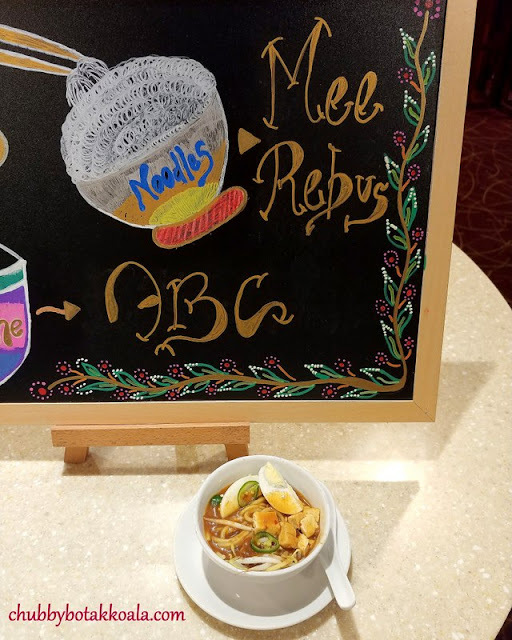 An interesting combination of this clear yet robust soup. 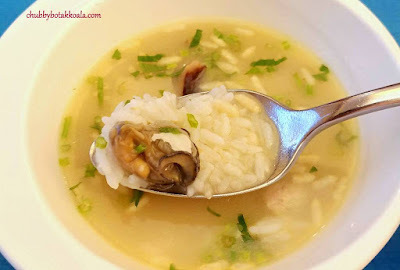 After further scooping, I finally found the dried scallops, clams and mushrooms that gave this soup added natural sweetness and seafood flavour in it. Roasted Chicken Chinese Style. Nicely executed, the skin is thin and crispy, while the meat is juicy and succulent. They provide the salt and pepper dip with lime, however, I found that the chicken is tasty enough. Deep-Fried Garoupa with Mango Salsa. 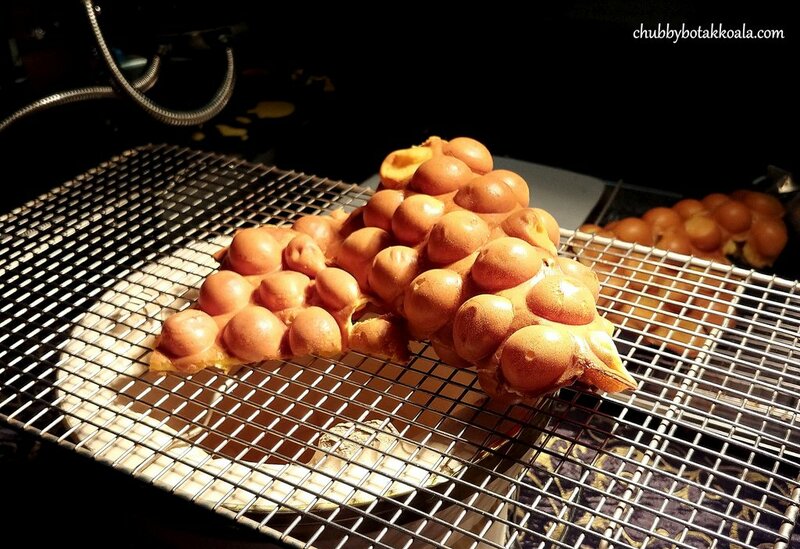 The huge garoupa is coated with flour and deep-fried, resulting in a crispy skin and moist flesh. 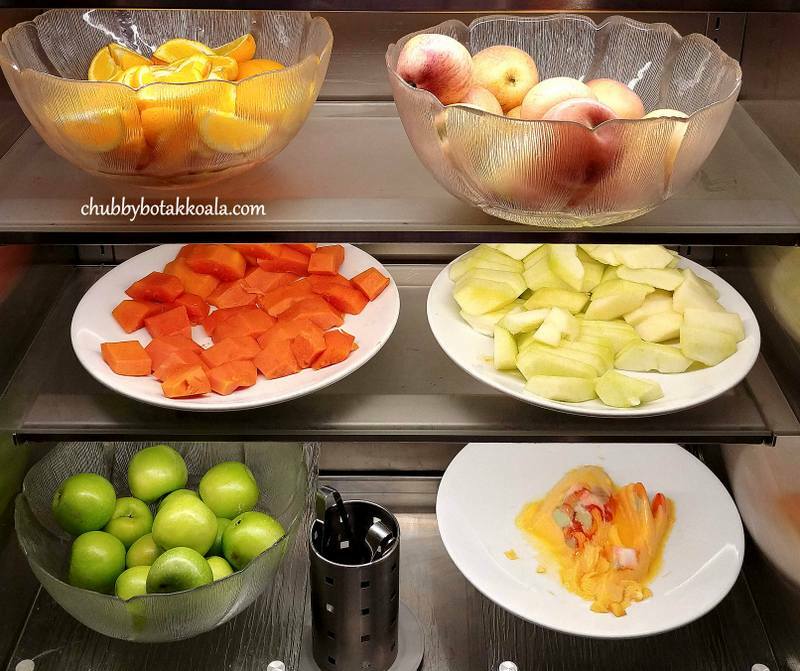 The mango salsa sauce is added afterwards to provide a sweet fruity taste to the dish. I like this dish as it is not spicy, however, some diners might prefer some spicy sauce for the dish. Deep-Fried Garoupa with Mango Salsa. The full buffet spread will be available for this special occasion. For the full menu, please refer to the YWCA Fort Canning Lodge website or Facebook Page. The menu might differ from the highlights above due to the availability of the ingredients. When: 4 & 5 May 2019 and 11 & 12 May 2019. 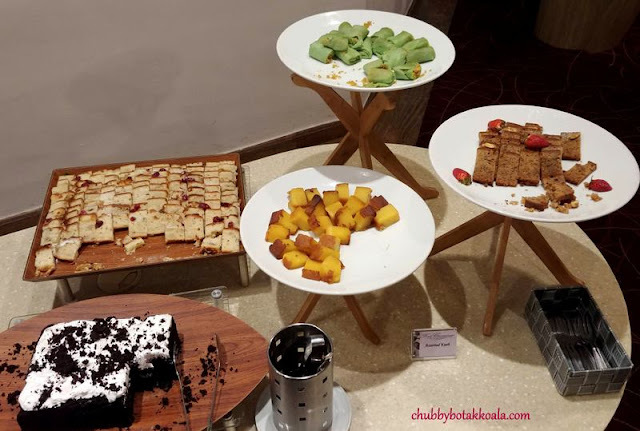 Promotion: Book and Dine for 4 & 5 May 2019, you will receive a 25% discount for Mother’s Day Buffet. Thank you very much, Purple Eats for the tasting invitation; Vu Marcoms and Café Lodge Team for hosting the tasting. Price: S$32++ for Adult, $15.80++ for Child. *Check out their Facebook Page for Promotion with NTUC and SAFRA Member. 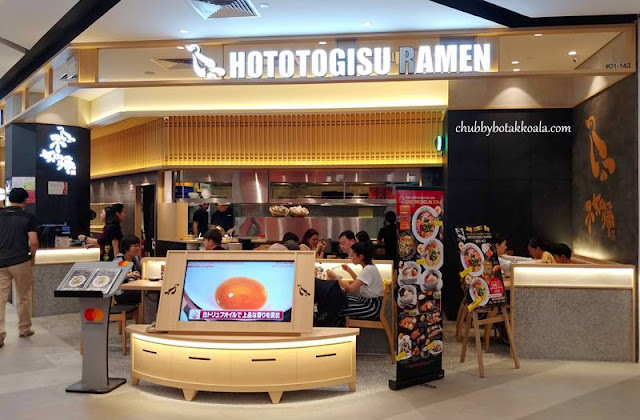 Konjiki Hototogisu Ramen (‘KHR’) is a One Michelin Star Ramen Restaurant from Tokyo. KHR also recognise being “No.1 Ramen in Japan” in 2017 and 2018 by Ramen Walker, Japan’s popular magazine. Each of their Ramen restaurants specialises in different flavours. The one at Great World City, specialises in Oyster base broth. Oyster Paitan Ramen ($15.90) is one of the signature ramens here. The broth is made from Miso and Oyster Consommé, while the toppings include oyster paste, dried tomato, baked lemon slice, roasted corn, arugula, low-temperature cha shu, black pepper and onion. The menu will teach you how to eat the ramen, I suggest you follow it. 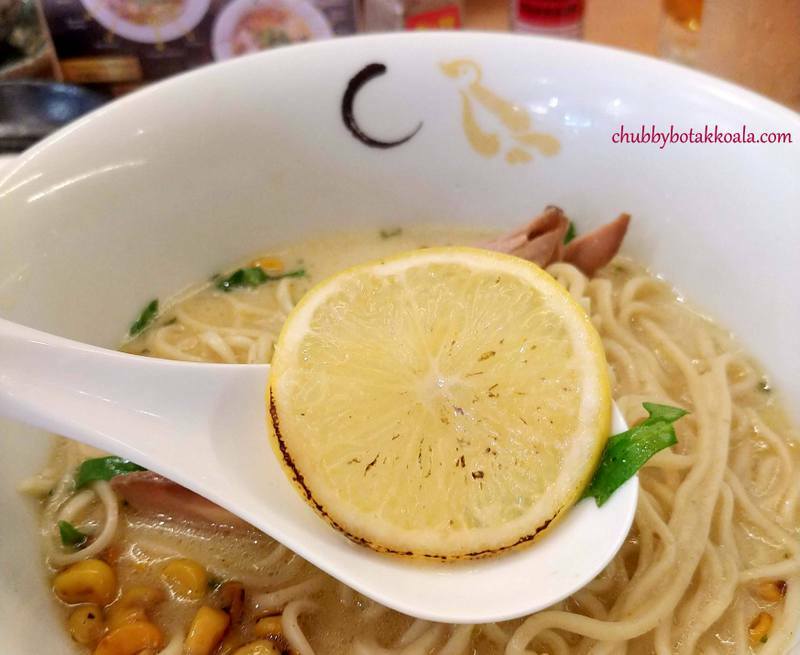 Once the bowl arrived, try to slurp the broth and the ramen before mixing it together. The miso is rich and creamy. When you stir the rest of the ingredients in, the oyster paste added an intense seafood flavour to the ramen. The aburi lemon and dried tomato help to cut the richness in the ramen. 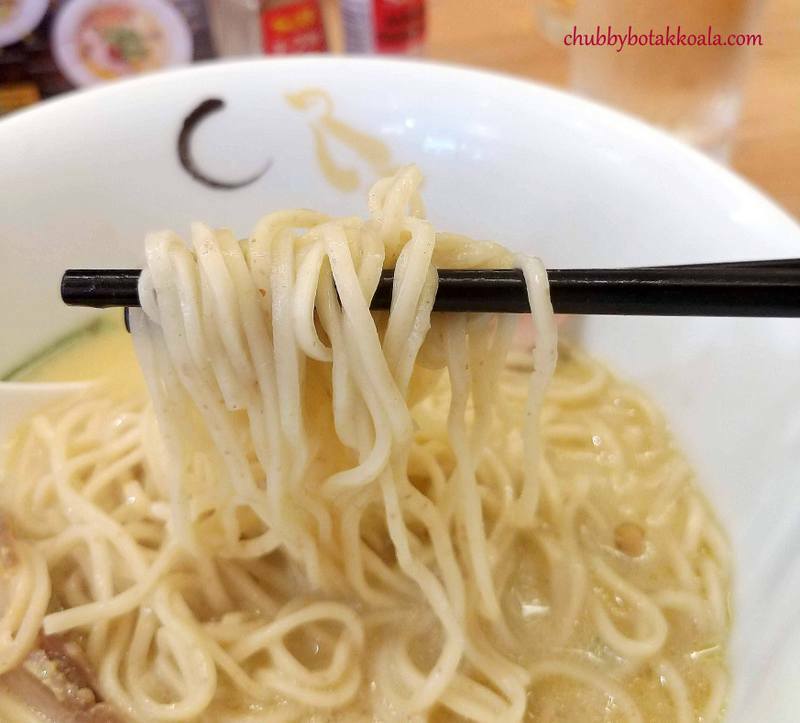 The noodle is thin and springy while cha shu has a soft, melt in your mouth texture. 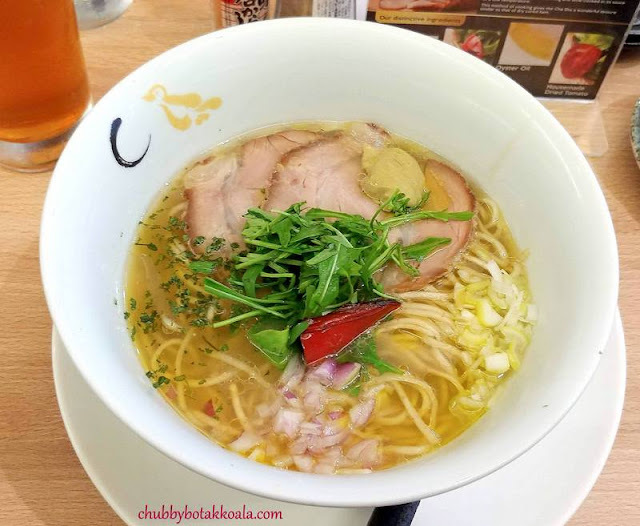 I like their topping of aburi corn and arugula, it is definitely unlike traditional ramen version. Meanwhile, if you like something lighter, go for their Oyster Shio Ramen ($15.90). This is the clear broth version of the oyster ramen here. Toppings include oyster paste, arugula, red paprika, garlic butter lemon, red onion, scallion and parsley flakes. 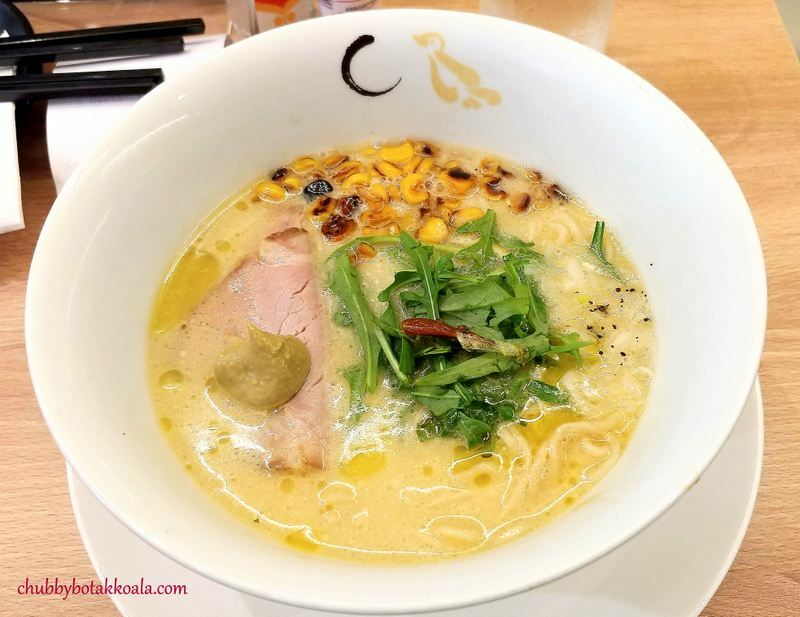 Same as the Paitan Ramen, slurp the broth at first. 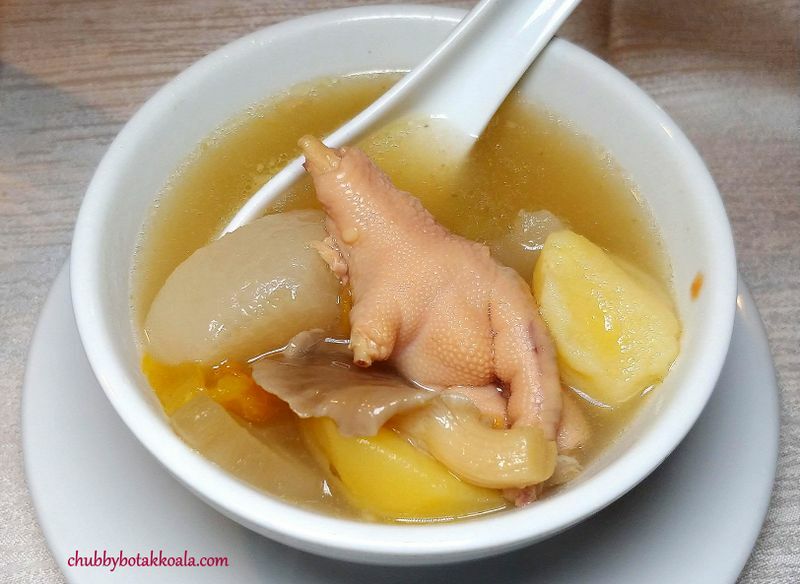 The broth is light but filled with delicate touch of saltiness. Once you stir the broth, the oyster flavours really shine in this dish. The garlic butter lemon, paprika and red onion added contrasting flavour in the ramen. Although both ramens are delicious, I need to warn you that the portion is very petite. 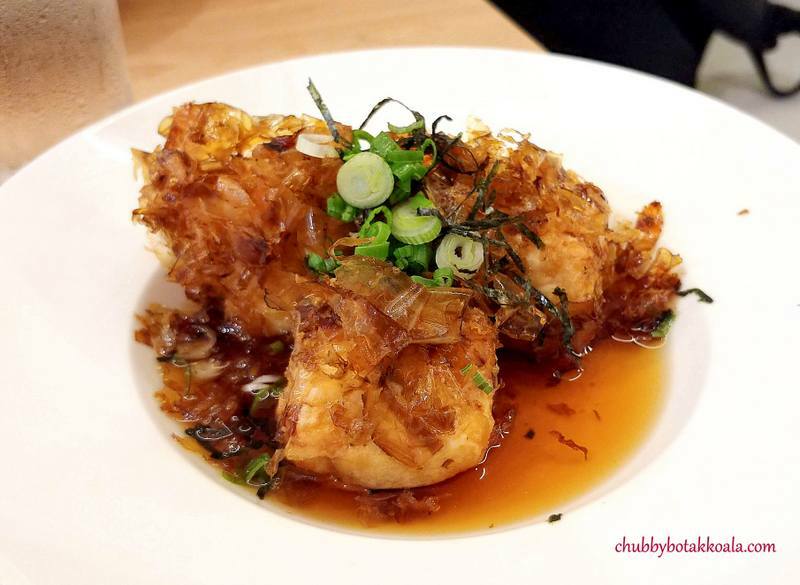 Fried Tofu with Bonito Flakes (3pcs $6.90). Crisp externally but soft internally. The bonito shavings are generous, ensuring each bite of the tofu will be filled with the bonito. Service is helpful and efficient. The décor of the place like a modern ramen restaurant sprouting in shopping centres. The main colour use is pine wood combine with open concept. Overall, the oyster ramen at Konjiki Hototogisu Ramen is definitely special and unique. The use of oyster with their miso or salt soup broth, allow us to enjoy the goodness of oyster in a different way. I’ll definitely come back to try their other ramen or the other branches as well. Kanpai! Cheers! Budget per Person: $11 - $25, $26 - $50. AquaMarine, Halal-certified buffet at Marina Mandarin Singapore is showcasing Hong Kong Cuisine of yesteryear. 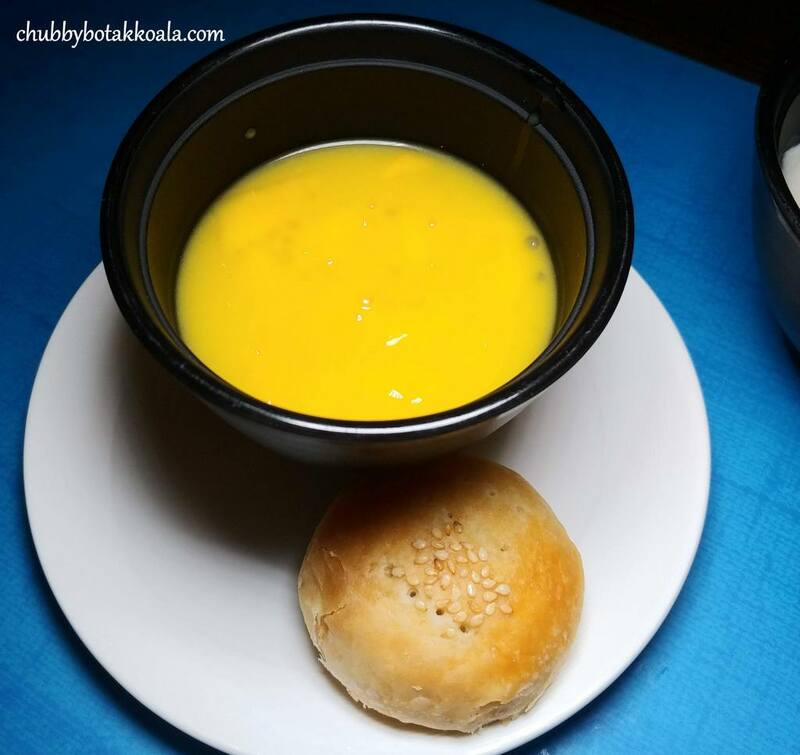 Bolo Bao, one of the most popular buns in Hong Kong that is garnering tractions in Singapore. 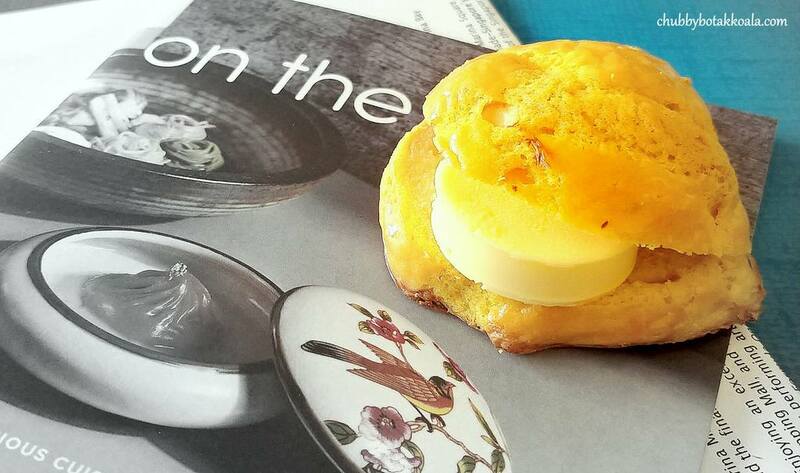 This mini version at AquaMarine is served with a generous slab of butter. Best paired with Hong Kong Milk Tea that is part of this buffet as well. You will notice the selling drinks cart parked just outside AquaMarine. 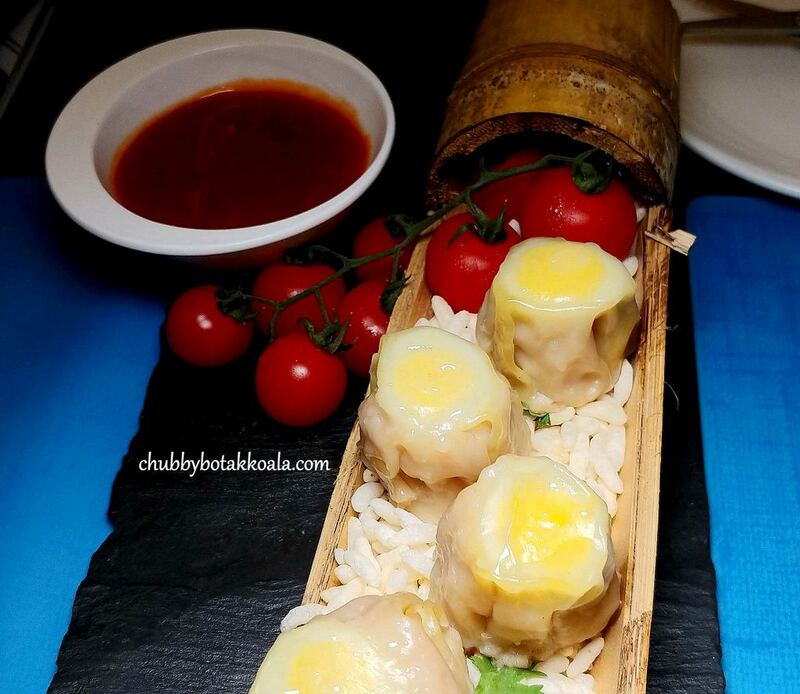 Traditional Quail Egg Siew Mai. This chicken Siew Mai is delightful. 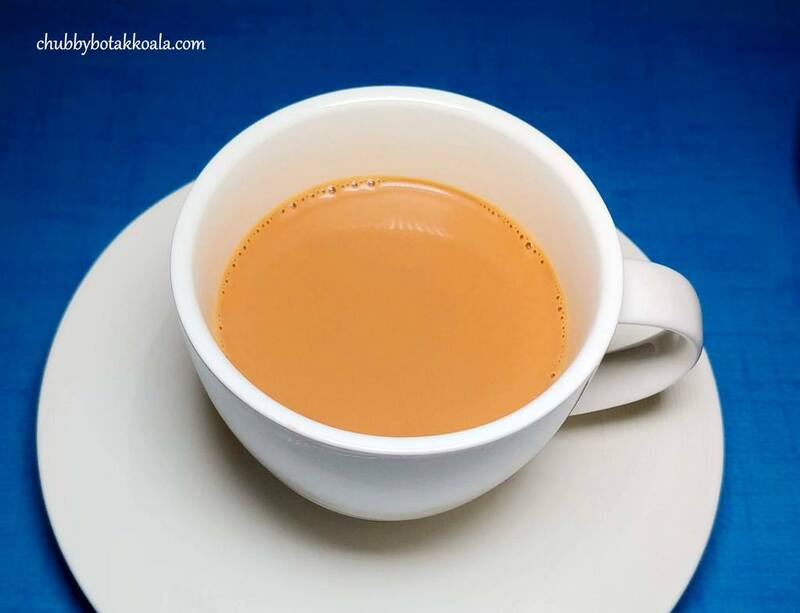 It is firm, bouncy and delicate in flavour. I actually never tried this in Hong Kong before, but as a dim sum, this version is very good. Traditional Quail Egg Siew Mai. Braised Beef Rib with ‘Mui Choy’. A beef interpretation of the traditional old school dish Mui Choi Pork. The fattiness of this premium beef ribs created awesome juiciness in each bite. 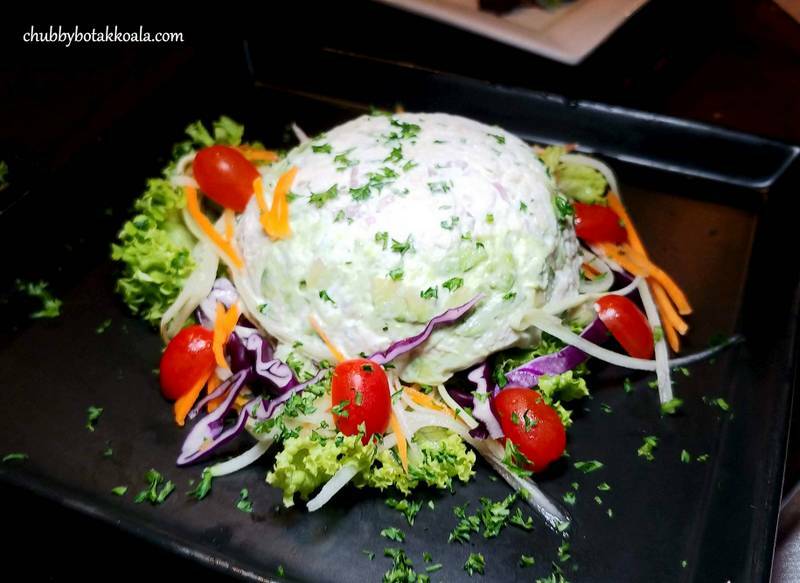 The 'Mui Choi' sauce added the naturally sweet and saltiness to the dish like the traditional Hong Kong Way. Chui Chow Oyster Congee. 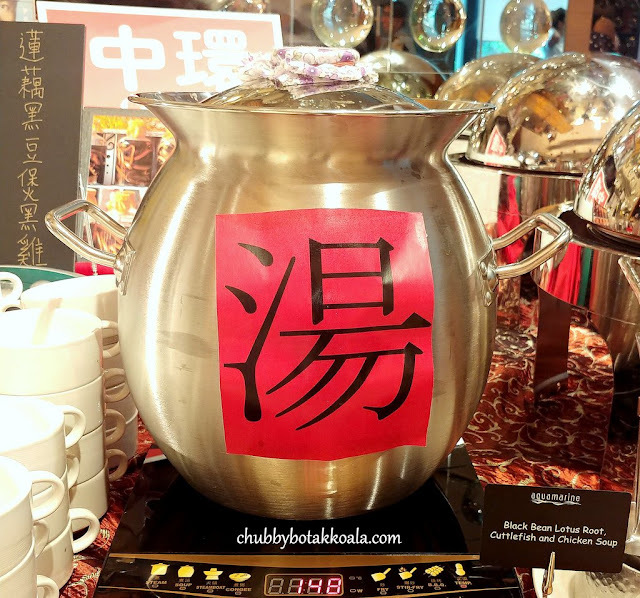 A version of Teochew congee that is popular in Hong Kong. The broth is robust, the rice is still in grainy version while the plump oyster adds the briny seafood feel to this congee. The toppings of fresh coriander, dried shrimp and rice puff added complexity to this dish. Yum Yum. Pan-fried Abalone Cheong Fun with XO Sauce. 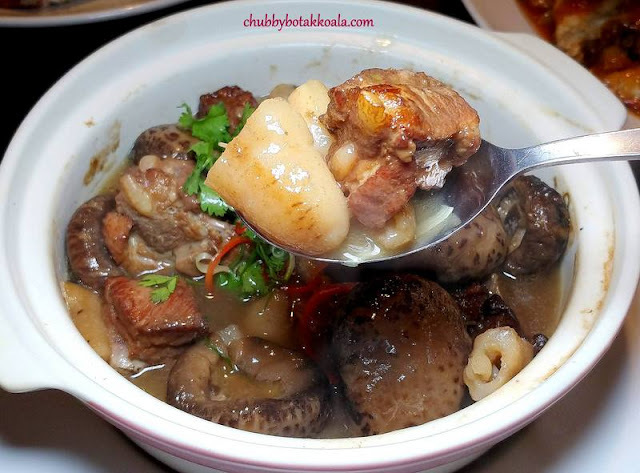 A luxury version of Cheong Fun. The Cheong Fun is pan-fried with my favourite XO sauce. Some part of it is crisp, the flavour of the XO sauce really shines. Topped it up with robust Abalone sauce and mini abalones to creating a WOW dish. Pan-fried Abalone Cheong Fun with XO Sauce. Claypot Lamb Brisket with Bamboo Shoots. One of Hong Kong dish that I really like. The lamb brisket is well braised, not gamy and melts in your mouth. 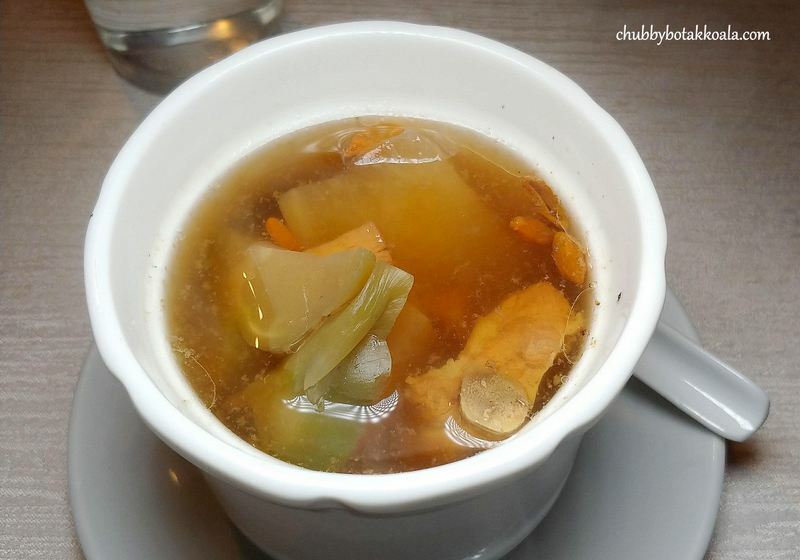 The shiitake mushrooms and bamboo shoot absorb the delicious gravy. 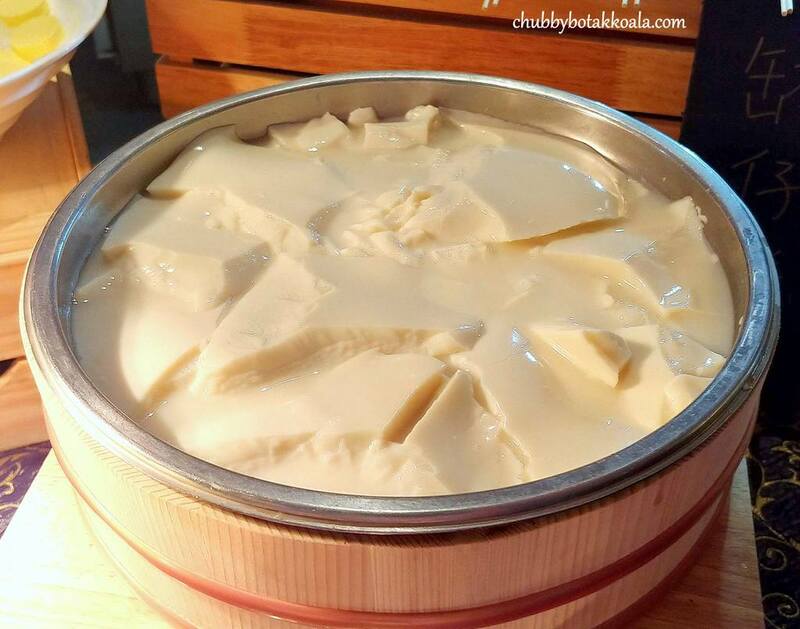 You should have this dish with sweet fermented soybean sauce (Chee Hou sauce). 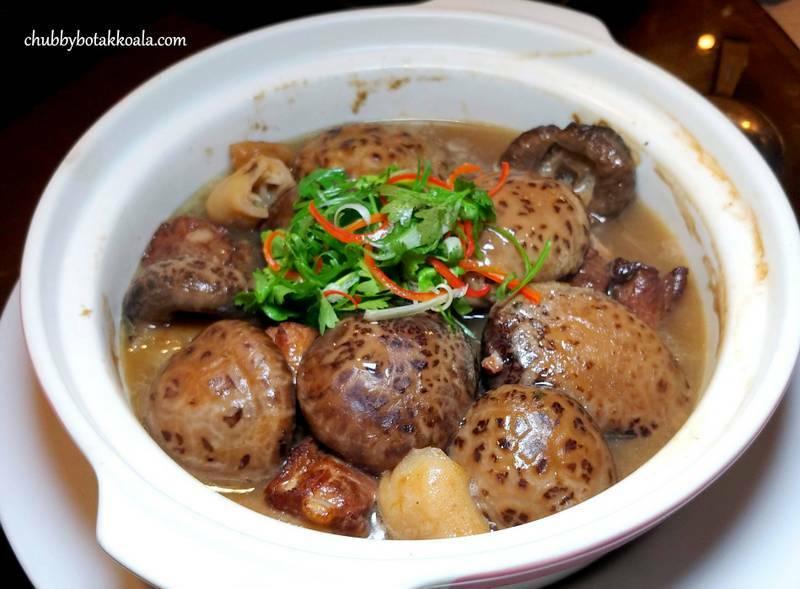 Claypot Lamb Brisket with Bamboo Shoots. 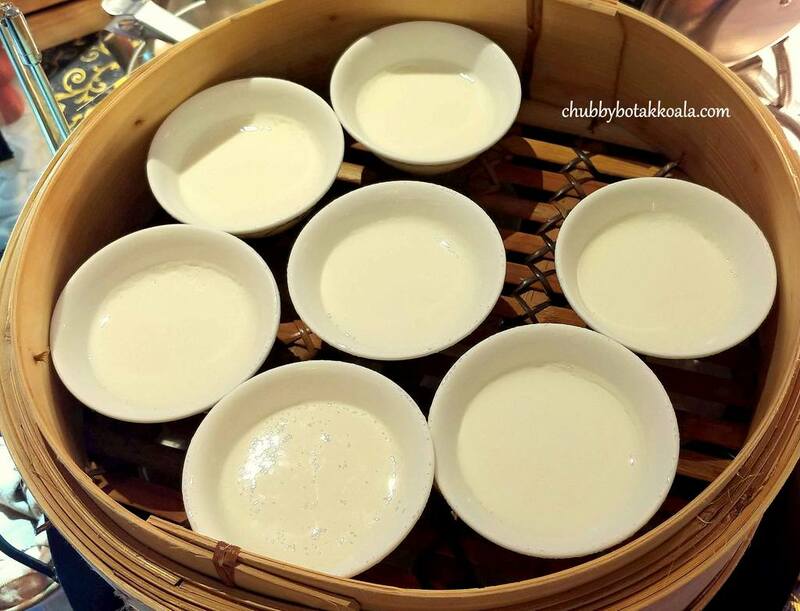 A must try in the menu is Baby Lobster in ‘Bi Feng Tang’ Style. The baby lobster is deep fried with garlic, ginger, chilli and spring onion. It is so aromatic that you can smell it miles away. The flesh is crisp externally, but aromatic and tender internally. Dip it with the mix of garlic, ginger and chilli coating the lobster for those delicious taste. If you still have some space before desserts, the DIY Hong Kong Cart Noodle station is also worth a visit. 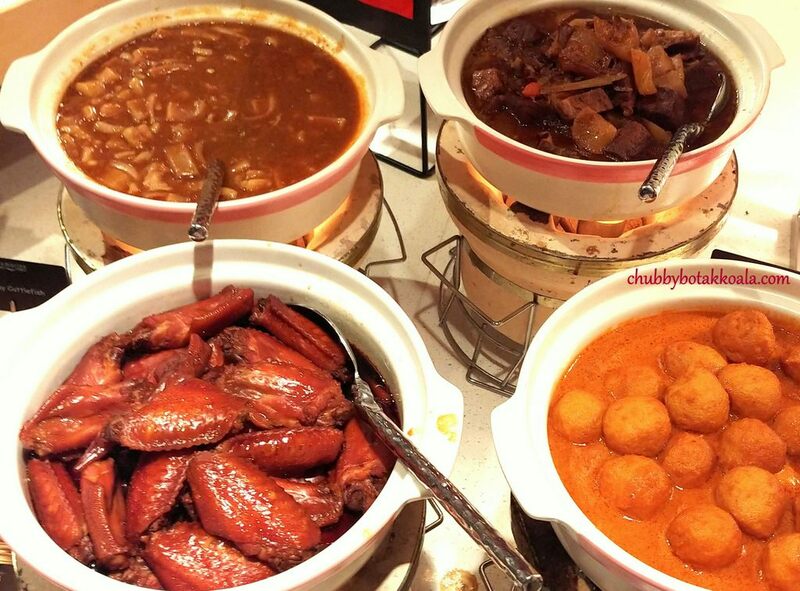 The toppings of Curry Fishballs, Soya Midwing, Salty Cuttlefish and Braised Beef. The Soya Midwing is just amazing, as the braising sauce infused well into the chicken. Meanwhile, the hot robust broth, making this cart noodle a really special one. For those who like rice dishes, I strongly recommend Plain Rice served with Chicken Oil and Dark Soya Sauce. Just get a small scoop of rice, drizzle it generously with Chicken Oil and some Dark Soya Sauce. Stir or fold it evenly, until each grain of rice turned dark. Then eat a scoop at one go. I guarantee you; it is just exquisite. Just like the dim sum dish of steam rice with chicken. Yum Yum. 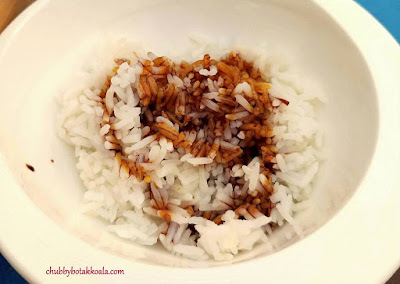 Plain Rice served with Chicken Oil and Dark Soya Sauce. 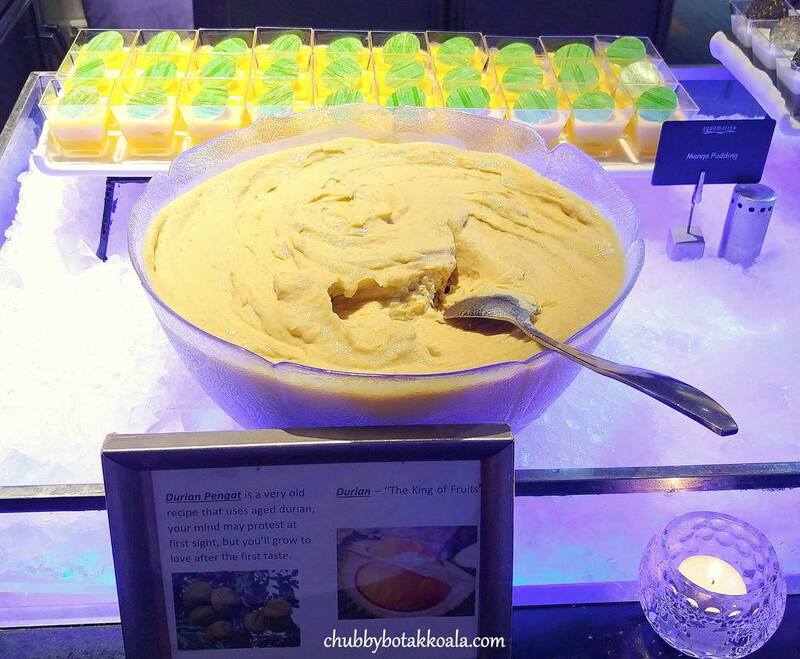 Hong Kong Desserts. There are Hong Kong Egg Waffle, Soya Beancurd, Mango Sago, Strong Ginger and Sweet Potato Soup, Milk Pudding, Red Bean Steamed Rice Cake, Lao Po Ping, Tao Sar Ping and a lot more. 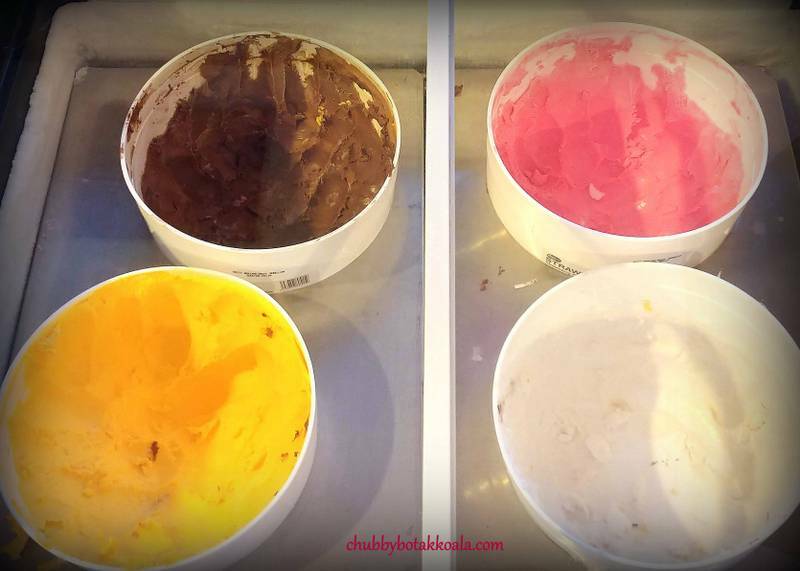 What a tough decision to make, choosing the desserts that suit you. 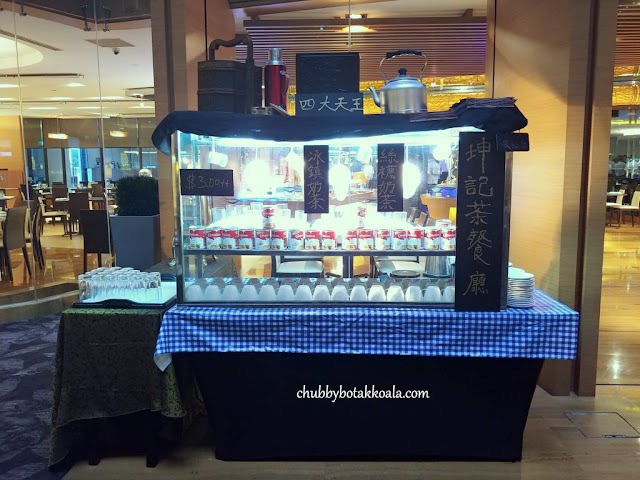 These spread of Old School Hong Kong Delights dishes are available together with their regular selections of Cold Seafood Spread, International Cuisine, Desserts Spread and of course the famous Durian Pengat. Overall, I am very impressed with the lineup and it was just awesomely good. My personal pick is Oyster Congee, Abalone Cheong Fun, Claypot Lamb Brisket, Cart Noodle and Plain Rice served with Chicken Oil and Dark Soya Sauce. Yummy!! Thank you very much Marina Mandarin Singapore Team for the tasting invitation. Lunch Mon – Fri: 12.00 – 14.30. Lunch Sat, Sun and PH: 12.00 – 15.00. Dinner Daily: 18.30 – 22.00. For enquiries and reservations, visit www.meritushotels.com/marina, call (65) 6845 1111 or email: aquamarine.marina@meritushotels.com.